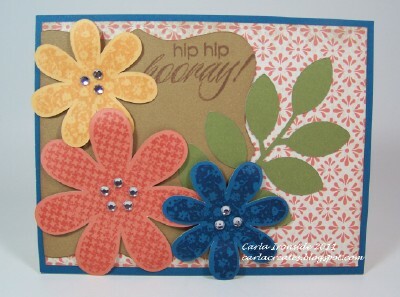 A quick & fun CTMH birthday card for you today - - made a few months back for one of my make & take projects at a crop I co-hosted - - I somehow missed posting it here on the blog. I love this colourful & cheerful card so I wanted to share it here as well! This is CASE'd almost exactly from my friend Fancy Melissa! You can find her card HERE. The gorgeous blossoms, the leaves, and the bracket shape were all cut with the CTMH Art Philosophy Cricut cartridge. The flowers (and sentiment) were then stamped with a stamp set called Hooray Bouquet, one of my favourite stamp sets! Notice how the stamp shapes coordinate perfectly with the Cricut cuts! Love that! The paper is CTMH's Elemental and the bling is CTMH's Clear Sparkles. (The flower colours are Creme Brulee, Sorbet & Pacifica - what a great colour combo!) We added some dimension to each flower petal by gently curling the tips around a pencil, etc. before adhering to the card. I love this Carla. So pretty.